IN 1829, Spanish explorers passed through the Mojave Desert valley in Nevada, USA and found a clear-running creek slicing through a marshy grassland. They called it Vegas  The Meadows. That proved the nucleus of one of the greatest casino cities in the world. Water attracted the regions first mail route and mormon pioneers. By Nevadas 1864 statehood, those footprints had become wagon wheel ruts. Water was the valleys first must-see attraction. Abundant springs and a centralised location  half way between civilised territory attracted officials from the San Pedro-Los Angeles and Salt Lake Railroad to the Las Vegas Valley in 1902. 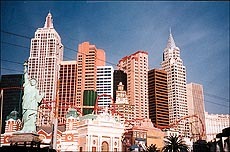 Las Vegas became a gambling haven when it was formally founded in 1905. Initially accommodation was sparse. At Ladds Hotel, $1 bought travellers eight hours of sleep in a shared bed. Critics vilified the tent city and lamented the "tuneless banging of the towns only piano." By 1909 Las Vegas featured six hotels, a hardware store, and 11 saloons at Block 16, a whiskey-soaked district featuring bawdy houses and gambling halls. Cards and dice were legalised in 1931, and it proved an enticement for Hoover Dam workers. A decade later, the EI Rancho opened and automobile traffic increased from Los Angeles. Perhaps remembering that shared double bed and cacophonous piano, the Last Frontier advertised itself as "the Early West in Modern Splendour. "Accommodation and entertainment improved since 1905. Today Las Vegas, the town of neon-lights does not permit you to sleep the whole night. Going to sleep in Las Vegas may be a sin and a waste of time. The neon Eldorado provides you a host of dazzling spectacles. The 70 million Fremont Street when neon shows are not on remains a stage for filming movies, television commercials and musical video shows. Las Vegas does not live by night alone. It has a promising dawn. The orange sun rises above Frenchman Mountain (also known as Sunrise Mountain). On a typical day in the life of Las Vegas the sky is clear (Southern Nevada has clear skies 310 days a year). Las Vegas basks in bright sun. The city is full of interesting facts and figures  its vital statistics, so to say. You have to break a lot of eggs to serve breakfast in Las Vegas. At Caesars Palace hotel alone, an average of 7,700 eggs are fried, poached, scrambled and boiled each day. With 2.8 million eggs delivered each year to that one resort, the chickens are kept busy. With 427 pounds of coffee consumed every day, theres always a pot on. Add to that a glass of orange juice. In Caesars Palace, more than, 3,000 ounces of orange juice is poured every 24 hours. 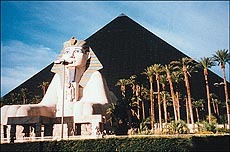 In Las Vegas, exotic hotels dominate the landscape with more than 8600 rooms and suites all over. 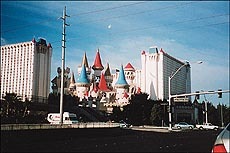 Las Vegas boasts of 12 of the 13 largest hotels on earth. 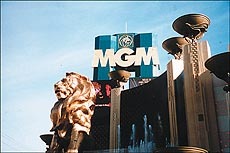 Foremost is the MGM Grand Hotel and theme park. With its 5,005 rooms and suites, be prepared to lose your sense of scale  and occasionally your sense of direction. Its largest suite is a two-storey city within a city that stretches out more than 6,000 square feet. The $1 billion MGM has 18,000 doors and 93 elevators. Its pool area is larger than three bootball fields. In the fun city of Las Vegas, God is not deemed to be in heaven alone. There are about 50 chapels all over the place. More than 80,000 couples are married each year  Wedding bells chime every six minutes round the clock. In the little white chapel, couples in a rush to start the honeymoon can use the drive through window. Few things symbolise Las Vegas as does the slot machine. Although nickels, quarters and silver dollars are the most common coinage used, select slots accept tokens ranging up to $ 500! Surprisingly all the gambling doesnt take place in the casinos. Billions of dollars are wagered in the citys three dozen sports books. Betting takes place on everything from baseball to thoroughbred horse racing. The standust race and sports Book are the best known. Las Vegas was largely built on the romantic mythology of luck. Visitors who come to town hoping to break the bank sometimes go broke. Fun, food and entertainment are the surest bets in town. Remember hope springs eternal in human breast; so it never hurts to try to have the Lady Luck on your side.